Eating healthy can be expensive. It doesn’t have to be, but we’ve been picking out healthy meals that look good at random and buying whatever we need to make them without even thinking about budget. Go figure we blew right through that. Since we have a vacation coming up and we’re trying to watch our cash a little better until then, we had to come up with an alternate plan for grocery shopping this week. We still shopped at the store, but first we shopped our freezer! We found about 5 lbs of meat, several bags of veggies, tons of tortillas, a whole wheat pizza crust, bread, and 8-10 servings of soup that was already portioned out. 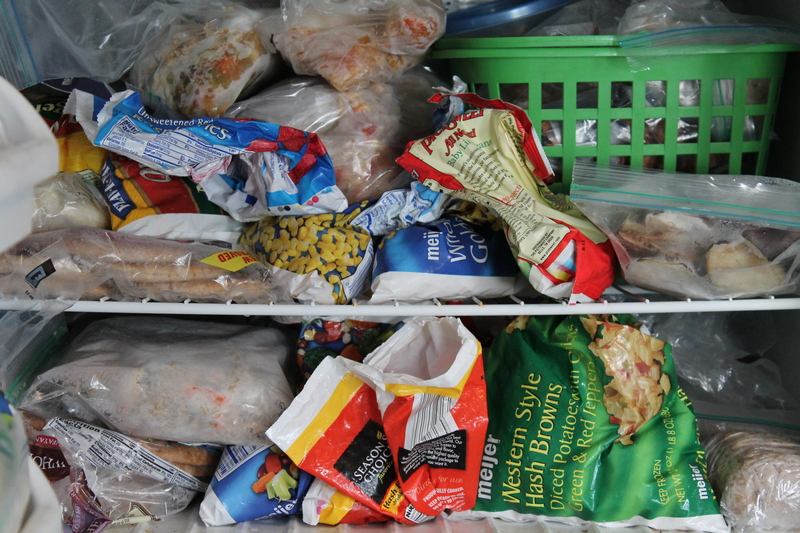 The freezer has been overstuffed for a month or two now. You’d put something in and have to quickly close the door and pray it stay closed. That packed. So it’s great to be able to get rid of some of it. Next weekend I’m hoping to get a few dollar store bins to keep things organized from now on. I can’t find the recipe for this, but it’s so easy I know it by heart! It’s originally from a Biggest Loser cookbook but I can’t remember which one. (I know, so helpful). It’s just 1lb cooked meat of choice, 1 cup low sodium chicken of veggie broth, 1 cup cooked beans of choice, and 1 cup all natural salsa. Doesn’t even need to be precooked and it tastes amazing! Again, no recipe just a premade whole wheat thin pizza crust, 1/2 lb of pre cooked chicken, a chopped green pepper, a chopped jalepeno, 1/2 chopped onion, 1.5 cups pizza sauce and 1 cup mozzarella cheese. Like I mentioned, kind of a weird combination of things. The taquitos should make 4 servings for my husband and 4 servings for me, the chili will be doubled so 2 servings for my husband and 4 servings for me, the eggplant parmesan will be 1 serving for my husband and 2 servings for me, and the pizza will be one serving for my husband and 2 for me. By the end of the day today, he’ll have 10 premade meals in the fridge plus some sandwiches. I’ll have 12 servings which will just get me through most of the week. We may make brinner (breakfast for dinner) one night too. Another food-related goal for this week has to deal with my sugar consumption. I have a big sweet tooth (which is probably full of cavities). It’s a problem. I maintained my weight and stayed totally within my calories last week, but I felt like the muscle tone I was beginning see and feel has become non existent the past couple weeks. That directly coincides with the release of Valentine’s Day candy. I love conversation hearts but they are pure sugar, artificially flavored and colored. Fantastic! The next three weeks, I’m going to be putting the sweets aside. I’m still going to have a little dark chocolate with my dessert because I didn’t notice a pudgy belly issue with that, but the candy hearts will mostly be a no go. I’m still thinking it’d be okay to treat myself to a small handful of them one night a week. But that’s it. I may have to have my husband lock them up for me! What do you have cooking this weekend?